When setting up your outdoor retreat, it is easy to overlook small details that will make a huge difference in the overall comfort for you and your guests. When paired with one of our Berlin Gardens chairs, this Amish Poly Footstool is sure to be the perfect place to kick your feet up and really get the most from your outdoor furniture. Available in every beautiful poly color as your Berlin Gardens chairs, you're sure to find a footstool to compliment your decor. Going green in style! 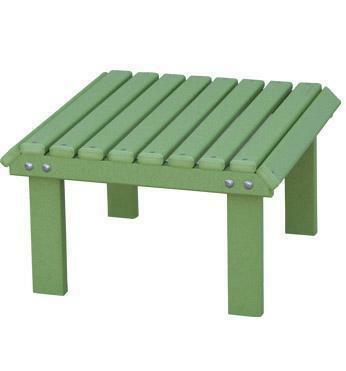 This footstool is crafted from poly - an environmentally sustainable lumber that is made from recycled plastic. (Typically milk jugs and detergent bottles.) So, while you're enjoying the natural beauty of our planet, you'll have the piece of mind knowing that you helped turn waste into outdoor furniture that will last decades!